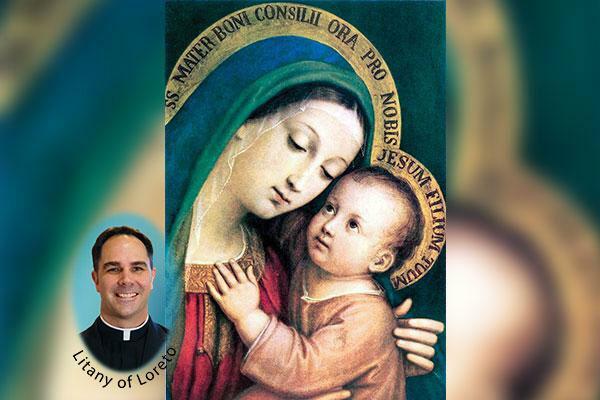 This is the fifth article in a series on the Litany of Loreto. Every month, I will explain this popular prayer, line by line, providing you with spiritual and theological insights. View the previous article in this series. Whenever you have a problem, question, or difficulty, you take it to your mother and you hope to receive good counsel. The Blessed Mother gives the best counsel. She wants to direct us and guide us so that we make the right decisions and have a good future. The name "Mother of Good Counsel" is also the name of a famous image that can be found in a church of the same name in Genazzano, Italy, near Rome. This fourth-century church was given to the Augustinians to restore, but when they ran out of funds in 1467, something miraculous happened. All the residents of Genazzano heard a beautiful melody coming from above, and when they looked up, they saw a white cloud descend upon the church. After the cloud vanished, it revealed a beautiful painting of Our Lady holding the Child Jesus in her arms. Dozens of miracles were reported as a result of this icon's appearance. This doesn't mean that Mary is God or that she made God. It spells out the simple logic that she's the Mother of Jesus, who is God. By this reasoning, she's the Mother of God, and since God created everything, she's the Mother of Our Creator. It emphasizes that Mary is not the mother of just some teacher or prophet. She's the Mother of Jesus — God made Man. Even though He was her little Boy, He happened to have created the universe. So she's the Mother of the Creator of everything — including herself. It's a paradox! Along the same lines of thought, we forget that since Jesus came through Mary, He even looked like her. He inherited half of his chromosomes from His Mother, so He definitely would have had her countenance and features. This title alludes to the prophecies in the Old Testament that a virgin would give birth to a Son and rule the nations and be called Emmanuel, God with us. It's important on another level, too. The blessed fruit of her womb is the Savior of the world. He's not just a teacher or a prophet or one among many other options. She's not the mother of a savior, but the mother of the only Savior. View the next article in this series.